Dear Jade, you are responsible for Logistics & Socials of the 5th edition of SPRIMUN. We would like to know more about you and your role at this event. What is your favorite moment at a MUN? I’d say it is when the MUN starts. Delegates are usually excited about the event and meeting each other. They wonder what will be the outcomes of the negotiations. The opening conference is also one of the most memorable parts of the MUN with the participation of fascinating guests. Why have you decided to join the SPRIMUN organization team? My first MUN was in 2013 in Edinburgh. I enjoyed it so much and I haven’t wanted to stop getting involved in MUNs ever since. I want other people to enjoy them as much as I have during my MUN experiences. That’s why I decided to join the SPRIMUN organization team and to make the SPRIMUN the greatest MUN that has ever existed. Can you reveal a secret about the socials at SPRIMUN 2017? We’ll be keeping the surprises a secret, before revealing them to you once you come to Rennes. But I promise you that it will be unbelievable. What is the most important value that one could uphold in your eyes? I consider the respect of others as the most important value. During MUNs you’ll meet people from all over the world and it’s important to have respect for each of them. It is also important as a delegate to have respect for the delegates who represent hostile nations during the negotiations. What kind of party do you prefer? I particularly enjoy fancy parties during MUNs. Many thanks for your answers and see you soon at the conference! Dear Victor, you are responsible for the Communication of the 5th edition of SPRIMUN. We would like to know more about you and your role in this event. → What are your expectations when you take part in a MUN? I am always looking forward to a great debate. To my mind, the most important thing in a MUN is the diversity of profiles and nationalities in the delegates in order to have the most comprehensive approach of the topics. I expect to return home having learned things about the hot-button issues of international relations as well as elements from other cultures and maybe some basic foreign words. → Why have you decided to join the SPRIMUN organization team? The SPRIMUN and I go a long way. I started university in September 2012 and participated at the first SPRIMUN edition in 2013, it was my first MUN. I loved it so I decided to join again for my first chairing experience in 2015 and I also had a great time. As it may be my last year in this institution I decided for my final turn that I would make this edition the best Rennes has ever seen. → How would you characterize SPRIMUN 2017? 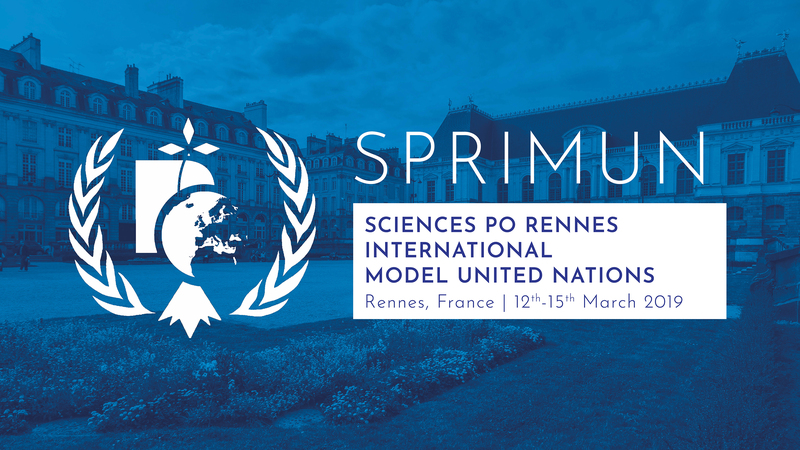 SPRIMUN 2017 is a binding and demanding project, especially because we want this year’s edition to be the best and the most opened Sciences Po Rennes has ever organized. We already have a lot of different nationalities and profiles in the delegates and we hope that dedicated students from all around the world would continue to come to this amazing city to debate with us. → What is the craziest thing you saw in a MUN? In February 2014 I participated to the ScotMUN in Edinburg, and somehow after the socials I lost my way to the hostel and got to a place called the Café Voltaire, where I met this guy named Ed, with whom I rode in a bicycle-cab to the casino to find him arguing with his former rugby trainer he didn’t see in 10 years. So here I stood, drunk, in a suit, in the middle of the slots, trying to patch things up between the two crying and finally hugging, when a friend of the trainer, kind of a muscle mountain, just looked at me and said: “You talk too much: now I give you ten seconds to shut the hell up and get out of here”. And believe me, I did. → According to you, does life have a sense? I tend more and more to think that the aim of life is to acquire abilities from matters you are not supposed to handle, whatever that means. Marie Elise, you are responsible for the Committees of the 5th edition of SPRIMUN. We would like to know more about you and your role at this event. What do you enjoy the most in a MUN? Participating in a MUN is both enjoyable on a professional and on a social level. In three days, you get to know more about global politics, you can experience public speaking and you can meet people from all around the globe, it really is enriching. I always feel very sad when a MUN is over, because it is so intense and it is a real escape from ‘normal life’. I have been involved in MUN activities for quite some time now, having been a delegate, a chair, and the President of Sciences Po’s MUN society. I felt like it was high time to try and see how a MUN was made from scratch. Why is SPRIMUN 2017 a must-attend event? First, the team is highly motivated and all of the members have a strong experience regarding MUNs. Everyone knows what they are doing, so you should definitely expect an unforgettable conference. We will furthermore have a new committee in French – the Human Rights Council/Conseil des droits de l’homme – and this is definitely a must-try this year. What are your strengths and weaknesses in life? I think that when I am involved in a project I do it as seriously as I can. But on the other hand I can be too bossy and I know that, for instance, when I chair I really don’t like it when it is too relaxed, I’d rather see the debate moving forward until the very last minute of the debate than joking on undiplomatic matters. Many thanks for your answers and see you soon at the conference ! Dear Lisa, you are responsible for the Delegates of the 5th edition of SPRIMUN. We would like to know more about you and your role in this event. What is your best MUN memory? Good question! It was probably during SPRIMUN 2015, I was representing the United Kingdom. The chairs were very good friends of mine so, at the end of a session, after a fruitful and intense debate, another delegate and I decided to send them anonymous notes with some weird/funny MUN pick-up lines. I remember seeing one of them opening the notes, trying very hard not to laugh and showing it to the other chair who had trouble holding it in as well. No one understood what was happening, it was hilarious. What is your role as Delegates Manager of the SPRIMUN organization team? My role as Delegates Manager consists of many various things: I am basically in charge of the relations between the SPRIMUN staff and the delegates, I am taking care of the registrations of the delegations and individual delegates (visa procedures, hotels, which countries they are to represent, which committee there are in etc). I will be making sure all the delegates are at ease and ready to debate fruitfully. I am working a lot with all the other SPRIMUN staff members since everything has to be coordinated. Why should we all take part in SPRIMUN 2017? You should take part in SPRIMUN 2017 because I guarantee you that we are a wonderful team of 9 people determined to make of the 5th edition an amazing one. You have the opportunity to learn a lot in terms of international relations and gain knowledge and experience, you will get to speak in front of an audience in a foreign language, meet a lot of people coming from many various places around the world while having a lot of fun! Why would you say no to such a thing? What are your strengths and weaknesses in a MUN? In a MUN, I am a very sociable person, I really love meeting people, debating, and partying with them. Besides, if I have an objective, I won’t give up on it, just like I will stick to the position of my country no matter how hard it can be to defend. However, it hasn’t always been easy to be representing a country from the minority group during some debates. Given the fact that you don’t have a lot of allies, you’re kind of the « outsider ». Being able to make yourself heard and taken into account was a bit tough, especially among the dominating delegations, but that was an amazing challenge as well! I got to strengthen the relations my country had with others, so that at the end, we were a team, a small one, but a real one! What is your leitmotiv in life? A very close friend of mine used to say, « it will all be alright at the end darling, if it’s not alright, it’s not the end ». I know this quote wasn’t originally from him, but he always brought this up when needed. It is what has been guiding me ever since. We are extremely happy to open the Chair recruitment process for the 2017 Sciences Po Rennes International Model United Nations! You can find details on the Chair application page! Benjamin, you are responsible for the finances of the 5th edition of SPRIMUN. We would like to know more about you and your role in this event. What makes a MUN special is first and foremost the delegates who take part in it. My fondest memories of MUNs come from the heated debates I had with delegates who were on the top of their game on the floor, but who were also turning up the heat on the dancefloor during the socials. So far I’ve enjoyed three great SPRIMUNs, including last year’s one where I represented the United States during a crisis committee in which humanity was tragically cut short by a series of nuclear explosions. The SPRIMUN is always a MUN that is great fun and I’m hoping to play my part in making this year’s edition the best ever. Can you give us a secret away about SPRIMUN 2017? I have heard a rumour that this year’s secretariat is one of the sexiest ever, but I cannot confirm or deny this for the moment. Delegates will no doubt have to come to the SPRIMUN to find out if there is any truth behind it. I’ve always found it very easy to dream, so to choose the biggest of them all is quite a task. While I could pick quite a few noble dreams, some more individualistic ones, and even a few realistic ones, my biggest dream without a doubt would be to see my favourite football team, Southampton FC, win the Premier League. Pleasing me is not a very hard thing. Even a bad joke can sometimes make me laugh my socks off. But I’m by far my happiest when I’m in arm’s reach of some form of alcohol and surrounded by friends I can have fun with. Erwann, you are responsible for organizing the 5th edition of SPRIMUN. We would like to know more about you and your role in this event. What do you enjoy the most at a MUN? I was a chair at most MUN’s I participated in, so I would say that my favourite part of any MUN is when delegates find unexpected solutions to the situation they are dealing with. It’s almost always when the resolution is amended that you find new propositions and ideas that can everyone can agree with. It is also the part when everyone can truly participate: sometimes, when it’s your first or second MUN, delegates can find it difficult to write a whole resolution. Amendments allow everyone to take part in committee work and that’s what makes it so challenging for a chair. The SPRIMUN was my first ever MUN back in 2013. It was my first glance at diplomatic work and it was truly inspiring. Amongst all MUN’s that I participated in, the SPRIMUN has always been special for me: it was also my first experience as a chair in 2014. Since I was a part of the last three editions, it was only logical for me to participate in the organization of such a wonderful conference. The 2017 edition of the SPRIMUN is its fifth edition. To celebrate this particular occasion, our goal is to keep what has always been great about our MUN: its location, its delegate diversity and its level of committee work. For this year’s edition, our goal is simple: make it the best edition Rennes has ever seen. For this, we will put all our focus on the committees and make sure that they truly represent the issues at stake in the UN today. The committees have been crafted for this purpose and I’m confident that every delegate will enjoy this edition! I like first and foremost to keep busy and in all matters, I do my best so that everyone can benefit from my involvement in all projects. I am very careful about details and procedure (which makes an annoying chair). I have a tendency to try and manage everything but this year, the SPRIMUN team is so efficient that I don’t even have to! Which country is your favourite to represent at a MUN? I have a weakness for the Russian Federation: the position is always interesting and delegates like to listen to Mother Russia when its delegate speaks. Plus, it’s always interesting to waive a veto threat if you’re in the Security Council. I had a really interesting compromise with the USSR in the 2015 edition of the SPRIMUN when chairing the historical UNSC: the USSR was threatening to veto because of a word in the preambulatory clauses of the resolution. It took almost an entire afternoon to work around that, that was really fun! Meet the 2017 Team ! We are extremely happy to present you the 2017 Sciences Po Rennes International Model United Nations team ! You can find details on the Secretariat’s page ! The 2016 conference has come to an end! 108 nuclear bombs dropped in the Crisis Committee! We look forward to the next edition and to see you next year! Information regarding the Chairpersons is now available!